Sitting in the Grand Cayman airport waiting for our flight to go back to the states (sniff). 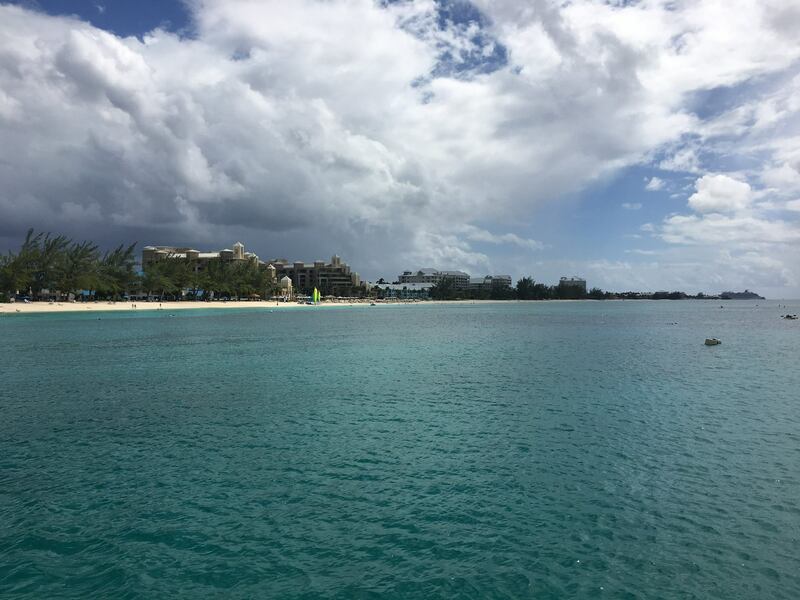 Thought I would provide our itinerary, highlights, do’s and don’t s for vacationing in Grand Cayman. Saturday (10/15/16): Got in early (10:30 AM) and rented a car from Hertz ($7 per day plus fees..$130 for the week). Checked into the “Grand” Caymanian “Resort” which is really just a Holiday Inn that is no where close to Seven Mile Beach despite what it’s address says. It is not “Grand,” nor is it a “Resort.” This was our first mistake: Small pool that was closed numerous times during the week, maid service ONCE for the entire week, “Work-out Room” 8’ x 10’ with No working equipment, large dead bug in the bedroom, weak shower, no beach, TV service failed repeatedly, etc, etc, etc. We smartly upgraded from a studio to a normal room, so we had a living area, kitchen, washer and dryer. We drove through George Town and West Bay, getting to know the area and shopped for groceries. Fruits and vegies were surprisingly expensive. Had a nice dinner at Dukes with margaritas, crab cakes, Caymanian seafood steampot and seafood jambalaya. Sunday: Almost everything is closed on Sundays. We drove to Kai beach near Rum Point, swam out to the reef and had a nice snorkel trip with clear water and lots of fish. Found out later that we needed to go farther West for the better snorkeling. Drove along the Southwest beach and stopped for lunch at a seaside restaurant and had our first conch fritters. For dinner, since we forgot to get salad dressing yesterday and with all stores closed, I stopped at Wendy’s for apple chicken salads on my way home from World Gym for a workout.